A delegation of 10 Australian entrepreneurs and philanthropists has visited Idan HaNegev, the Negev’s pioneering Jewish-Bedouin cooperative industrial park. The all-women group was hosted by representatives of the Triguboff Institute, a major player in the project’s development, and co-organised by Philanthropy Australia. The visit was part of a five-day experiential trip to Israel, focusing on impactful investment, strategic philanthropy and the ambitious ways Israel uses business strategies to accelerate social change and cultivate environmental well-being. The women were greatly impressed by the project and with Harry Triguboff’s efforts on behalf of the Bedouin in the Negev. “The Chamber is very proud of the Australian connection to the Idan HaNegev Industrial Park. The Triguboff Institute’s work in assisting the local Bedouin community integrate in the factories there is inspirational and is making a profound contribution to Israel’s vitality as a world leading multi-cultural society based on Jewish values like ‘Tikun-Olam’ (mending the world),” said Paul Israel, Executive Director of the Israel-Australia Chamber of Commerce. The visit included a tour of the 1100 acre industrial park led by Moshe Paul, CEO of Idan HaNegev. 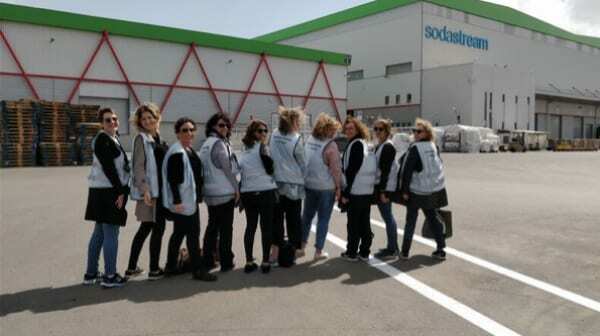 The group also visited SodaStream, a company devoted to culturally respectful, multilingual equality that employs Jews, Palestinians and Bedouin in full equality. The environmentally conscious, DIY carbonated beverage company made headlines in 2016, when its spokesperson Scarlett Johansson was criticised and the company targeted by the BDS movement. Idan HaNegev’s goal is to develop industry and encourage cooperation among the authorities of Rahat, Bnei Shimon and Lahavim in the northern Negev region. The Triguboff Institute works to develop and empower the Bedouin community, which makes up 35% of the Negev inhabitants, by promoting employment opportunities, improving socioeconomic status, in turn, reducing crime. It also aspires to be a bridge between the Israeli and Bedouin communities in the area. The status of women in the community is an area of focused investment for the Triguboff Institute at Idan HaNegev. It provides vocational training, apprenticeships and a center of holistic support for the advancement of women, providing services for women’s health and welfare for those employed at the park’s various companies. The park will eventually supply 10,000 jobs. The group, members of Philanthropy Australia and Australian Jewish Funders, in partnership with the Israel-Australia Chamber of Commerce, was comprised of high net-worth Australian businesspeople and philanthropists as well as trustees and CEOs of charitable wills, trusts, private, corporate and family foundations. The delegation was led by Australian Jewish Funders Directors, Belinda Bardas and Simone Szalmuk-Singer. Others members included Debbie Dadon, Amanda Joske, Liora Miller, Ricci Swart, Suzan Beecher and Tracie Olcha.